Death – this is perhaps the only certainty in life. We all get to die one way or another, they always say. While dark, the concept of death is rather enlightening for it paves the way for new life – a new beginning with the Savior, and your dearly departed loved ones. Whether you see death as the start of another chapter, or the end of your story, there are many reasons why you should get inked with meaningful death tattoos. The grim reaper – the cloaked skeleton that it is – is always thought of as the bringer of death. His presence shows that death is just around the corner. Although the death tattoo of the grim reaper is a depressing memento, it can be a reminder for you to live your life to fullest. 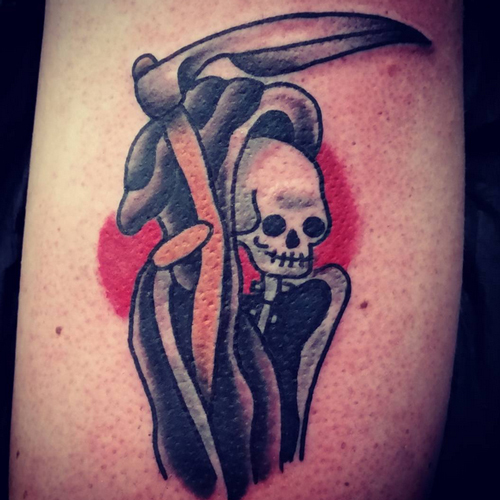 If you want to get a tattoo that tells you to do everything while you still can, then the grim reaper death tattoo is the design you should have on your skin. Skulls and skeletons are what remain after an individual passes on to the next life. 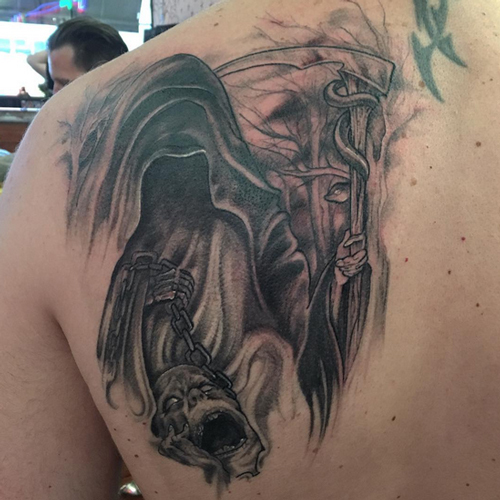 While this style of tattoo is a visual reminder of death, it can remind a person to let go of its material possessions since he cannot bring it along when he dies. A skull tattoo tells an individual to forego materialism and instead work on good memories that he can keep in his memory for eternity. The Jolly Roger is a symbol is known to many as a skull drawing with two crossbones underneath. Commonly linked with pirates, the Jolly Roger is also a famous choice for those who wish to get death tattoos. While its design is considered morbid, the Jolly Roger tattoo depicts freedom. After all, this symbol is always associated with the pirate lifestyle – they do what they please without any care in the world. If you need to show your rebellion, and your desire to live a free, no-holds-barred life, then the Jolly Roger death tattoo is a good choice for you. The Death’s Head moth is often viewed as evil, just like the Grim Reaper. However, it can symbolize the beauty of life and live in the moment. Similar to the Jolly Roger design, the Totenkopf tattoo consists of a skull over two bones. While it is considered unique, the Totenkopf has a dark meaning. For years, it was used by Nazi Germans; that is why it is associated with racism and fascism. While the Totenkopf makes for a real death tattoo, it can give you weird looks especially if you do not know its underlying connection with Nazis. While death tattoos are considered dark, there are several designs that prove otherwise. With the beautiful meanings of different death symbols, there is no reason why you should not consider this design for your next inking.